Introduction: There exist two groups of ribonucleoproteins in the nucleus: the small nuclear ribonucleoproteins (snRNP´s) and the heterogenous nuclear Ribonucleopreins (hnRNP´s). In the nucleoplasm, the U1 snRNP along with other small nuclear ribonucleoproteins (U2, U4-U6, and U5) assemble into splicosomes that remove introns from pre-mRNA by splicing. The U1 snRNA forms base pairs with conserved sequence motifs at the 5\'-splice site and recognizes both the 5\'- and 3\'-splice sites and may have a fundamental role in aligning the two sites for the splicing reaction. The U2 snRNA forms base pairs with conserved sequence motifs at the branch point, which associates with a heat- and RNAase-sensitive factor in an early step of splicing. Heterogeneous nuclear ribonucleoproteins (hnRNPs) constitute a set of polypeptides that contribute to mRNA transcription, pre-mRNA processing as well as mature mRNA transport to the cytoplasm and translation. They also bind heterogeneous nuclear RNA (hnRNA), which are the transcripts produced by RNA polymerase II. There are approximately 20 known hnRNP proteins, which range in size from 34 kDa to 120 kDa, and their complexes are the major constituents of the spliceosome. The majority of hnRNP proteins components are localized to the nucleus; however some shuttle between the nucleus and the cytoplasm (hnRNP A1 and hnRNP K, f. e.). The A/B subfamily of hnRNPs include A1, A2/B1, A3 and A0. hnRNP A1 and A2/B1 regulate the processing of pre-mRNA by directly antagonizing the association of various splicing factors and by influencing the splice site selection on pre-mRNA. The 120 kDa hnRNP particle U is an abundant nucleoplasmic phosphoprotein and the largest of the major hnRNP proteins. hnRNP U is specifically involved in pre-mRNA processing and is directly bound to both RNA and DNA. hnRNP M is involved in pre-mRNA splicing and in stress-induced transient splicing arrest whereas hnRNPs F and H are largely related factors that preferentially associate with poly(rG) regions on RNA. OriGene Technologies offers a panel of antibodies to snRNP and hnRNP which can be used for immunological detection methods like western blotting, immunoprecipitation, or immunocytochemistry . Fig.1: Antibody Cat.-No. AM26527AF-N used for (left image) immunocytochemical detection of hnRNP-A2/B1 on acetone fixed HEp2 cells and (right image) Westernblot analysis of hnRNP-A2/B1 expression in Jurkat (lane 1), Raji (lane 2), HeLa (lane 3), MCF-7 (lane 4) and NIH/3T3 (lane 5) cells. 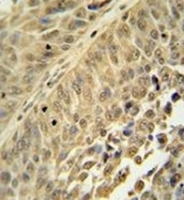 Fig.2: Immunohistochemistry analysis in formalin fixed, paraffin embedded human bladder carcinoma reacted with HNRNPC-antibody Cat.-No. AP52068PU-N followed by peroxidase conjugation of the secondary antibody and DAB staining. 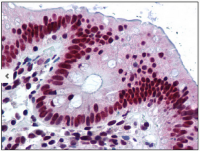 Fig.3: Immunohistochemical detection of hnRNPK in formalin fixed, paraffin embedded human colon using antibody Cat.-No. AM06025PU-M at 15 µg/ml after heat-induced antigen retrieval.